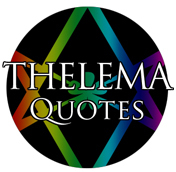 Thelema Quotes’ seventeenth installment deals with atheism. As always, all quotes are from Aleister Crowley or The Book of the Law. “This refers to the spiritual experience of Identity. When one realizes one’s Truth there is no room for any other conception. It also means that the God-idea must go with other relics of the Fear born of Ignorance into the limbo of savagery. I speak of the Idea of God as generally understood, God being “something ‘not ourselves’ that makes for righteousness,” as Matthew Arnold victorianatically phrased his definition. The whiskered wowser! Why this ingrained conviction that self is unrighteous? It is the heritage of the whip, the brand of the born slave. Incidentally, we cannot allow people who believe in this ‘God;’ they are troglodytes, as dangerous to society as any other thieves and murderers. The Christians to the Lions! “Atheists are of three kinds. The despairing wretch, who, having sought God everywhere, and failed to find Him, thinks everyone else is as blind as he is, and that if he has failed— he, the seeker after truth! — it is because there is no goal. In his cry there is pain, as with the stupid kind of atheist there is smugness and self-satisfaction. Both are diseased Egos. The philosophical adept, who, knowing God, says “There is No God,” meaning “God is Zero,” as qabalistically He is. he holds atheism as a philosophical speculation as good as any other, and perhaps less likely to mislead mankind and do other practical damage than any other. Him you may know by his equanimity, enthusiasm, and devotion. I again refer to Liber 418 for an explanation of this mystery. The nine religions are crowned by the ring of adepts whose password is “There is No God,” so inflected that even the Magister when received among them had not wisdom toe interpret it.